This list of Axiom Award-winning titles will assure the reading public that help is near, in a wide array of business topics, from Leadership and Entrepreneurship to hard-to-find categories like Business Ethics, Philanthropy and Business Fable. Read on and Prosper! "The Axiom Business Book Awards are intended to bring increased recognition to exemplary business books and their creators, with the understanding that business people are a very well-read and informed segment of the population, eager to learn about great new books that will inspire and inform them, and help them improve their careers and businesses. As it says on the Axiom Award medals, 'Laurus Lego Erudito,' or 'Success Through Knowledge.'" 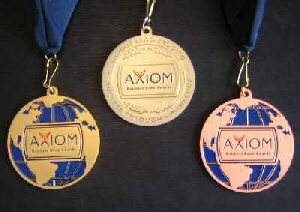 "The Axiom Awards are presented by Jenkins Group, a Michigan-based book publishing and marketing services company that has operated the popular Independent Publisher Book Awards contest since 1996. Founder Jerrold R. Jenkins is the author of three books on the business of publishing: Inside the Bestsellers, Publish To Win, and the 2012 release, The Independent Publisher: How to Build and Promote Your Best-Selling Book. You may order additional certificates with customized wording.